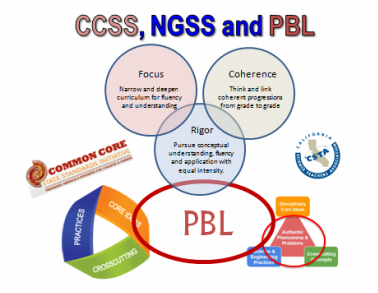 Common Core and Next Generation Science Standards have ideal platforms from which to launch PBL. Project Based Learning aligns well with Common Core Standards and Next Generation Science and Engineering practices. PBL is at the heart of the model that blends the coherent, focused rigor of engaging, authentic and captivating lessons that transfer to design and engineering practices, disciplinary core ideas and crosscutting science and engineering concepts.